Hillary Clinton has bagged almost half the Indian American bundlers this primary season. Federal law caps personal contributions in an election cycle to $2,300, limiting individual donations to a presidential campaign to $4,600, as the primaries and the general election count as separate elections. The way major presidential campaign donors stick out among the tens of thousands who make the maximum permissible contribution is not on the strength of their individual donation as much as by becoming “bundlers.” These bundlers typically package and bundle donations from friends, family, business and professional associates, etc., by hosting private and public fundraising events. Bundlers account for nearly half of the almost $160 million raised collectively by Sens. Hillary Clinton and Barack Obama in the first three quarter of 2007. A Little India analysis of the 2,493 bundlers in the 2008 presidential campaign identified thus far by the public interest watchdog group Public Citizen revealed 21 Indian American bundlers, almost half of whom work on behalf of Sen. Clinton. Sen. Obama has six Indian American bundlers, followed by two each for Sen. John Edwards and Gov Mitt Romney and one for Sen. John McCain. None of the other candidates listed any Indian American bundlers. The 10 Indian American “Hillraisers”, as Clinton’s bundlers are called, have each committed to raising over $100,000 for her campaign. 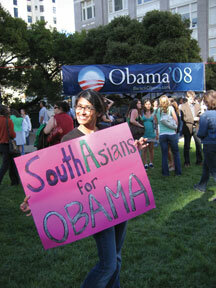 Of Obama’s six Indian American bundlers, four committed to raising $50,000 and two over $100,000. The other campaigns do not list the dollar amount their bundlers commit to raising. 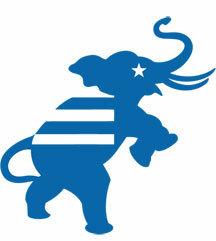 Not surprisingly, bundlers are often rewarded by winning candidates with political favors. A Public Citizen analysis found that one in five of Pres. 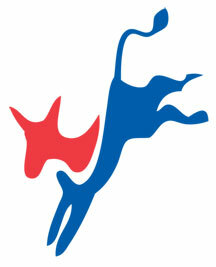 George W. Bush’s bundlers in the 2000 and 2004 campaigns ended up with government appointments. A CBS investigation in October 2007 revealed that 170 Bush bundlers secured official appointments, including four cabinet positions and 27 ambassadorships. 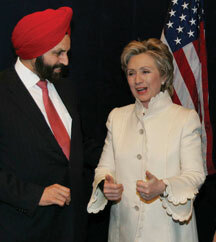 Bundlers are far more valuable than the legions of individual donors on whom candidates, and indeed the bundlers rely, as is illustrated by Sen. Clinton’s most visible Indian American bundler, the hotelier Sant Singh Chatwal. Chatwal, whose association with the Clintons dates back to Pres. Clinton’s first primary campaign in 1991, has reportedly raised $3 million for Sen. Clinton, headlined by a 1,200 person dinner in June 2007. He told Little India that he was confident that Indian Americans would easily top $5 million for her campaign. But Chatwal had not pitched in his own personal contribution to her campaign, as of the third quarter of 2007, according to records of the Federal Election Commission. However, several members of his family, including his wife Pardaman Chatwal, and two sons Vivek Chatwal and Vikram Chatwal (who is listed as a $100,000 bundler himself) contributed $4,200 apiece to Sen. Clinton’s primary and general election campaigns. Chatwal told Little India that he has held off making his campaign contribution thus far, as have other friends and associates, to pace them for campaign effectiveness. He said his personal contribution would be forthcoming in the “first week of January 2008,” adding that many other Indian Americans are “waiting for a telephone call” and would simply “be happy to write their donations.” Campaigns often want their fundraising timed for the best effect at crucial moments in the campaign cycle. Zach P. Zachariah, president of the Fort Lauderdale Heart Institute, who is arguably the biggest Indian American bundler ever, most certainly for Republicans, is thus far sitting out this primary season. Over the years, Zachariah, a leading Florida cardiologist, is reputed to have helped raise almost $19 million dollars for Republican campaigns ranging from those of Bob Dole and the elder Bush to the current president and his brother, the former Florida Gov. Jeb Bush. Almost a fifth of his fundraising money, Zachariah says, comes from Indian Americans. His financial contributions to the Bushes have not gone unrewarded. Zachariah has served as delegate to several GOP conventions; was appointed to the Board of Governors of the State University System of Florida; named to Pres. George W. Bush’s presidential advisory commission on Asian Americans and Pacific Islanders, and was a guest at the White House state dinner in honor of Indian Prime Minister Manmohan Singh. Another prominent Indian American bundler for the Bushes, Raghavendra Vijayanagar was appointed chairman of the Florida Board of Medicine by Gov. Jeb Bush. For his part, Chatwal claims, he has no aspirations for a political appointment: “I am just a businessman,” adding that his interest in supporting the Clintons is to promote India-U.S. relations, which is reflected in the five visits by Pres. Bill Clinton and three by Sen. Hillary Clinton to India, the greatest number by any U.S. president or presidential candidate. “In terms of returns, we’ve already got our money’s worth,” Chatwal said. Like Sen. Clinton, Chatwal refused to entertain the possibility that she might not end up winning the nomination of the Democratic Party. Asked whether he would support a party nominee other than Clinton, Chatwal insisted that the race would be decided in her favor on Feb 5 Super Tuesday, when almost half the states, including the delegate rich states of New York and California hold their primaries. “Iowa is not all that important,” he said, alluding to Clinton’s slipping numbers in the kick-off state. “Call me on Feb 6. I will be happy to talk to you then,” Chatwal said confidently.